What Does Intel Corporation's Broadwell-E Delay Mean for Skylake Xeon? A report out of the ever-reputable VR-Zone (via Tech Report ) claims that Intel &apos;s Broadwell-E processor for enthusiasts will be delayed into the first quarter of 2016, from what would have normally been a late Q3/early Q4 launch. While the impact of a delay of this product doesn&apos;t affect too much of the company&apos;s total PC business, the "E" products are based on the company&apos;s server-oriented Xeon processors, potentially implying a delay in the company&apos;s server chip schedule. If this turns out to be the case, then what does this mean for the timing of Intel&apos;s next-generation server platform known as Purley, which supports the Skylake Xeon processor? Sources: The Register, RealWorldTech, eWeek. Intel seems to space out each product family a minimum of one year, with slips in the schedule leading to longer gaps. For example, there was a roughly two-year gap between Westmere-EP and Sandy Bridge-EP, and a 1.5-year gap between Sandy Bridge-EP and Ivy Bridge-EP. If the rumor of a Q1 2016 launch for Broadwell-EP holds true, then assuming this is a March 2016 launch, it would represent another 1.5-year gap. So, what does Intel do about Skylake-EP? Shorten the Broadwell lifecycle, pull in Skylake? 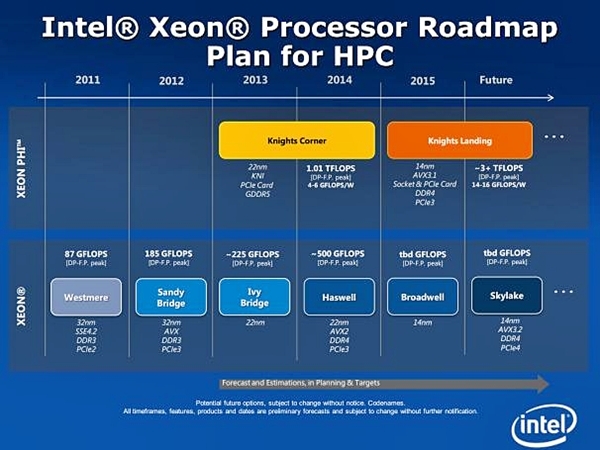 In an Intel presentation dated July 2014, the company refers to Skylake Xeon as a 2016 platform. Now, I fully realize plans may very well have changed between July and October (when the VR-Zone report was published), but it would seem Intel planned on Skylake-EP being a 2016 platform as of not too long ago. So, what Intel could potentially do is simply shorten the lifecycle of Broadwell-EP, as it seems to be doing with Broadwell in PCs. Since Broadwell-EP will plug into the same sockets as Haswell-EP, those organizations interested in upgrading to Broadwell-EP have an upgrade path. For customers looking for a bigger performance improvement, and willing to buy into a new platform, it might make sense for Intel to launch Skylake-EP in the second half of 2016 to capitalize on that demand. In a nutshell, Broadwell-EP will be a relatively minor upgrade, while Skylake-EP should be a big one. For segments Intel has claimed are very important and high growth (such as high performance computing), getting these new processors out as quickly as possible is likely to mean good things for revenue and profit growth. The article What Does Intel Corporation&apos;s Broadwell-E Delay Mean for Skylake Xeon? originally appeared on Fool.com.